Join the City of Culture army of volunteers. This week marks Volunteers’ Week, the perfect time to not only celebrate the invaluable efforts of the City of Culture Volunteers, who gave an incredible 337,000 hours of volunteering to the city, but to encourage even more people to think about signing up to become a volunteer. 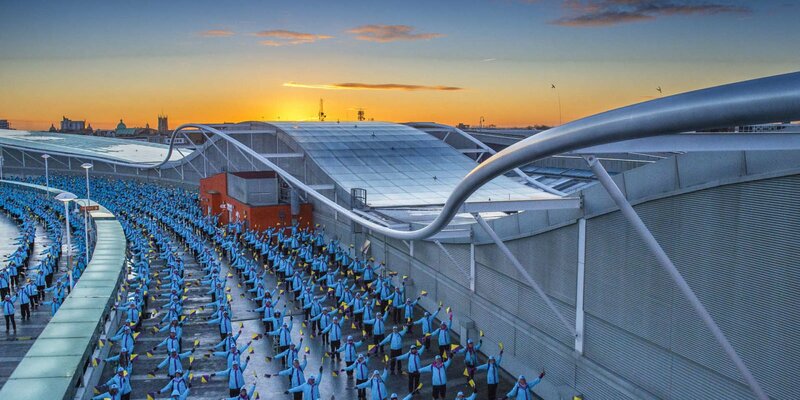 The award-winning City of Culture Volunteers became an iconic image of Hull’s year as the UK City of Culture however, last year was just the beginning. Under Absolutely Cultured the programme’s growth continues, with applications to sign up and be part of the blue-coated army now open until Sunday 17 June. The City of Culture Volunteers are a huge, enthused, curious, articulate family that has gone from strength to strength. They have already achieved so much, making an incredible impact on the people of this city and those who visited during Hull’s special year. While the programme will continue in arts and culture, there will also be opportunities in other areas, such as health and wellbeing, community and sport. It is a great opportunity to meet different people, make new friends and gain valuable skills and experience through supporting various events, and attending workshops and masterclasses. For many, volunteering has been life changing. We spoke to two of our Volunteers, Jack Whileblood aged 80 and Hannah Edgar aged 22, to find out more about their experiences. Jack has been supporting Hull’s City of Culture bid since 2015 and became a City of Culture volunteer in March 2016. Born and bred in Hull, he has spent his entire life in the city. He believes Hull’s incredible year has had a positive impact not only on the city but also in helping to change the perception of Hull. Jack explained: “As volunteers, we’re warmly welcomed wherever we go. I’ve had so many people approach me and congratulate me on the fantastic job we’re doing. It’s really humbling, but I always remind them that they can join and become a volunteer too. I actually had a fantastic experience with a family of five, where every single member of the family joined after I spoke to them! Hannah, a university student from Hull applied to volunteer for Hull 2017 when she realised she could fit it around her job and part time university studies. She said: “I also liked the idea of being able to pick and choose what I could do. I have always lived in Hull, and the changes I have seen since March 2017 are like never before. The community spirit has grown throughout the city and the city centre has benefitted from new pavements and features such as the water fountains. Applications close on Sunday 17 June after which there will be a selection centre on Saturday 30 and Sunday 1 July followed two weeks later by a three-part, fun-filled training day where the new volunteers will learn more about the city, its culture and try on the unmistakable blue uniform. This is where the journey begins before going on to be involved in incredible events and meeting new people, as well as having access to the City of Culture Volunteer Masterclass Programme. This ongoing suite of optional training ranges from creative writing and dance to an introduction to Hull’s history archives and heritage. The application form can be found at www.proudtovolunteer.co.uk and positive experiences and encouragement to apply are being shared on social media by existing volunteers who have had a profound positive impact on the city, using #proudtovolunteer. Volunteering applications close at 11:59pm on Sunday 17 June 2018. Anyone interested in applying should log onto www.proudtovolunteer.co.uk to find out more. When you submit this form you will receive an email to validate that your sign up is intentional. Once validated you will have confirmed that you are happy to receive emails from us and will be added to our newsletter email list. © 2019 Absolutely Cultured. All rights reserved. Registered Address: Pacific Exchange, 40 High Street, Hull HU1 1PS. Company number: 09106231. Registered Charity Number: 1162199.